There are many great things about this job but one of the best is finding wonderful artisans who are revitalizing the art of the past with talent and innovation. I am so proud to announce a new “Feature Artisan” to the site. Thistledew Merchantile is a lovely site that sells the historic scissor art by Kim Frey. One of the 2009 artisans featured in the Directory of Early American Craftsman that is published by Early American Life magazine (another one of our favorites) Kim is a very talented addition to our growing list of American Craftsman. Since 1990, the Freys’ artwork has been shown at local Art Leagues, in traveling exhibits with the Guild of American Papercutters, in special exhibits with Delaware State Museums, and in museum and gift shops across the country. Thistledew Merchantile can produce the “very thing” for your gift list and is a wonderful historical addition to any historic house museum’s gift shop. 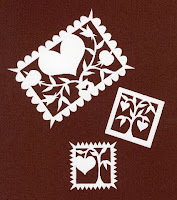 Scherenschnitte: a Pennsylvania German folk craft, literally meaning “scissors snipping.” Scherenschnitte was used to create Valentines, Christmas tree ornaments, cake stencils, artwork for the home, and shelf decorations. Fraktur: an artistic form of important documents such as birth, baptismal, and wedding records. Fraktur were also given as rewards of merit for good students, house blessings, and bookplates. The Freys live in Delaware with their daughter Katelyn, two goats, a whole bunch of chickens, and Oreo the cat. (Daughter Jordan, son-in-law Luke, and grandboys Jackson and Derik are staking a claim way out west!) Their artwork…and often the Freys themselves…can be seen in person at Hudson’s General Store, in Clarksville, Delaware. I urge you to take a moment and visit this site it is truly a new american treasure.